Construction Schedulers, Asbestos Removal, HVAC, Plumbers, Electricians, Masonry-Cement contracting, Paving, Ceramic tile designers, Mold Remediation, Facilities Clean Up, Water damage restoration and Roofing. Property Management- we manage the daily operations of properties (3) three family houses and or apartment buildings of (30+) thirty plus units to meet owner and residence expectations. We work with a number of qualified vendors concerning plumbing, electrical, landscaping issues while meeting all safety and municipality codes. Our management team understands the needs of the assets and residents to care for, monitoring and providing them with highest quality of life. To strive to provide training by bringing all our contractors to the table with update certifications. Majority of our contractors have also completed the 2015 Turner Construction School of Management and are OSHA 30 certified. AA Complete Property Care - Specialize in Lead and Asbestos Abatement Services. Servicing the State of New Jersey and New York. CERTIFIED LEAD EVALUATION ABATEMENT CONTRACTORS provides for the public safety, health and welfare insofar as they are affected by the identification and abatement of lead-based paint hazards. company. Operating in Essex County and supporting all of the New Jersey . 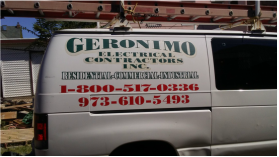 Geronimo Electrical Contractors Incorporated is dedicated to providing a complete and elite service to all clients and open to sub-contracting opportunities. Redr Royal Disaster Recovery - wth a name change of 5 Star Specializes in the areas of lead, mole removal. Their service also includes clean up following fire and water damage. 5 Star Restoration - Specialist in the areas of lead and mole removal. This company is also provides of service of asbestos removal . However Mold removal and abatement is their specialty. JW Contracting- Specializes in commercial properties, The company has completed jobs such as, Family Dollars, Dollar General , Roofing on a 5 story Condo community, supermarkets, motels and hotels. Specialty in roofing, finish carpentry, stucco, interior as well as exterior projects. --We are an equal employment opportunity employer. We are firmly committed to non-discrimination and equal opportunities for all applicants, contractors and internal employees. —Employment and contracting decisions are made solely on the basis of occupational qualifications and availability. We've finally found a construction consulting firm that provides the services they say. Their commitment to vendors is fair and concise. We have not been able in our eight (8) years in business found such a firm that is true to their word. I would recommend joining the team of QMG to help you grow your business as well as keep you apprised of training and contracting opportunities in NJ and NY.